Jason Repko, CF; Dioner Navarro, C; J.D. Drew, RF; Jeff Kent, 2B; Nomar Garciaparra; Bill Mueller, 3B; Ricky Ledee, LF; Ramon Martinez, SS; Odalis Perez, P.
I’m posting from the press box in Las Vegas in a 2-2 tie right now. I wanted to answer a few of the questions we’ve had, as I’m not sure I’ll get to post again tonight. In terms of the Blue Man Group footage, you’re in luck. KCAL was on site last night and will probably use a lot of the footage of the guys that took part in the show during their pregame shows this week. I’m not sure if we’ll get the players involved in the commercials yet, but we’ll see what fans think of the spots. There’s a good chance we’ll also use some of the Blue Man Group footage on DodgerVision this year, as these guys add a pretty neat entertainment element to the telecast and can do the same for in-game entertainment. As for how to follow the prospects this year in Las Vegas, the 51s PR Director Jim Gemma just informed me that you can listen to all their games online on the 51s website. And finally, there was a question about Tim Hamulack and the story behind him. Most of you know that he came over with Jae Seo in the deal with the Mets for Duaner Sanchez and Steve Schmoll. Tim made his big league debut last year with the Mets and only played in six games, but he had a 1.02 ERA in 28 games at Norfolk and 1.26 ERA in 21 games at Binghamton. He grew up in Maryland and played at Montgomery Community College there before being drafted by the Astros in the 32nd round of the 1995 Draft. He bounced around to the Royals, Mariners, Red Sox and Mets organizations before reaching the bigs last season. Tim’s a pretty quiet guy, but is also quite nice and I know he was surprised to find out that his contract was purchased yesterday. We touched down last night at about 9:00 p.m. local time and while a lot of guys wound up going straight to bed, a dozen of us headed to the Venetian for a 10:30 showing of Blue Man Group. As you’ve heard by now, they’re going to be doing KCAL’s commercials this year and invited us to check out the show while we were in town. While I didn’t know this was going to happen, they asked several of our players if they’d be willing to participate in the show and much to my surprise, the guys were good sports about it. Brett Tomko was on stage for about 10 minutes during a bit in which he and the Blue Men were eating twinkies. Jason Repko was on stage during an indescribable bit in which it appears they string him upside down and slam him into a wall. Though they didn’t actually do that, he wasn’t too phazed. "I’ve run into walls before," he told me afterward and we’ve all seen that in action. Nomar Garciaparra and Jose Cruz Jr. were called out for "showing up late" to the show, as a spotlight caught them sneaking into their seats after the show was in progress. It was a great experience and the fact that these guys played along was appreciated. Others who took in the show were J.D. Drew, Charley Steiner, Kim Ng and Pepe Yniguez, who was celebrating his birthday yesterday. We’ve only got a little time here in Vegas and I’ll head to the park in a couple hours. Our split-squad team, managed by Dave Jauss, is playing in Kissimmee as I post this blog. After tonight’s game, it’s back to Los Angeles for the Freeway Series and everyone’s getting pretty excited for Opening Day. I’m posting this blog from the plane, awaiting our departure for Las Vegas. Today’s game couldn’t have ended any better, with a walk-off home run in the bottom of the 10th inning by Sergio Garcia. Ned Colletti, who is standing next to me, just put it best: "What a great exclamation point to the spring." While there are still a few days left before Opening Day, this spring has been a huge success and the Florida portion was pretty great. 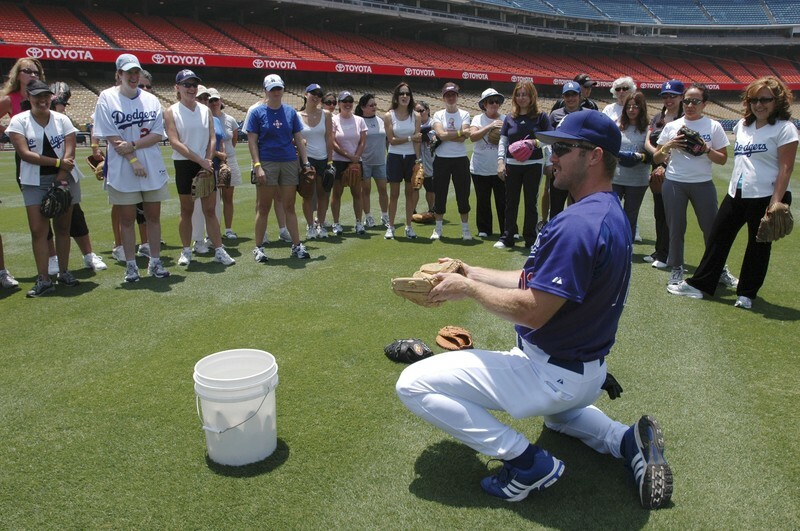 Eric Gagne pitched a scoreless inning while throwing on back-to-back days for the first time. Derek Lowe looked sharp in his final tuneup before Opening Day and now it’s off to Las Vegas. When we land, we’ll make our way over to the Blue Man Group show and then tomorrow, we’ve got a night game against the Mariners. Brad Penny will get his last start before the real deal and a lot of our regulars should be in the lineup. Scott Akasaki, our team travel manager, has also been very efficient at making sure every trip this spring ran smoothly. He’s actually right next to me, making sure that our contacts in Vegas know that we’re about to get up in the air, which means I should probably turn off my laptop. Just wanted to pass along the great news that Jeff Kent has signed a one-year extension with an option for 2008. This is a great way to finish out our time in Vero Beach and hopefully get us going on the right foot as we head west. I personally think this deal says a lot about the direction of the team and we’re all extremely optimistic about the season, with Opening Day just five days away. So this is it. Our final day in Dodgertown and while everyone can’t wait for the season to start, it’s always a little sad saying goodbye to this incredible complex. For those who haven’t been here, you should start planning your trip for 2007, as this is truly a unique experience unlike any other in baseball. Today’s lineup against the Nationals includes Dioner Navarro, who’s back in the lineup after straining his hamstring last week. Throughout the spring, I’ve had the chance to highlight some of the stories by our beat writers, but I’ve been getting a hard time from Bill Plunkett of the Orange County Register about not plugging him on the blog. He’s done a nice job covering the team this spring and for the past couple years, so be sure to take a look at his coverage on a regular basis. Another good win today, as Jae Seo looked awesome on the mound. Rafael Furcal’s back tightened up, though, so he left the game early and is listed as day-to-day. We’re all hoping it’s nothing serious and right now, we have no reason to believe it’s bad, but you never like to see one of your top players go down to an injury in the final days of spring. Meanwhile, ESPN has put out its predictions for 2006. It’s pretty cool to see that nine of 15 people picked the Dodgers to win the West and Rob Neyer picked us to beat the Twins in the Fall Classic. While these are only predictions, is does make you feel good about the way people view the team heading into the season. One more game left in Vero before we head to Vegas. Even though we spend a lot of time time here and people like to joke about "being ready to go home," we’ll certainly miss this place. Craig Callan and his staff take incredible care of us in our second home and we’re extremely grateful for all their hard work. Also, in response to some of the questions on the blog, this site will definitely be kept up throughout the season. We’re hoping to update it a couple times a day, but there will be times when it’s more often and times when it’s less often. It will definitely have the starting lineup before any other site on the Internet, so be sure to check in every day. In regards to Vin Scully and his travel schedule, Vin travels with us for all games against NL West teams during the season, so he obviously doesn’t go East of Colorado. During the spring, he has been kind enough to do all the games for KCAL, so was here this weekend and will meet the team in Las Vegas tomorrow, where he’ll do the game from Cashman Stadium. He also handles all home games. And finally, I can’t say that I know how Nomar’s health will be this season, but so far he’s been in great shape and seems to be enjoying the move over to first base. He made an incredible play there the other day and as a former shorstop playing first base, we can probably expect to see a lot of that from him this season. Things are winding down out here. Final decisions are still being made and to respond to one of the comments, no, there has not been a decision on Joel Guzman, but I’m sure it’s getting close. Four more players were sent out today to the minor league camp and we’re down to 34 guys. In today’s game, the team had 19 hits and Brett Tomko hit a homer, which he says is his first since Little League. Grady said after the game that he had turned to Dave Jauss, the bench coach, right before Tomko hit it and said, "I bet he’s going to be the first Dodger pitcher to homer this year," and Dave said, "I just hope it’s not before April 3." The next pitch, bam, it was gone. We’ve got two more home games and then we fly out to Las Vegas on Wednesday night. As some of you might have seen in the commercials, KCAL has hired the Blue Man Group to do their TV spots, so several of the guys on the team and a bunch of us staff members are going to head to the show when we get in town. Should be pretty fun. Otherwise, keep up the great chatter. It’s great to see 13 comments on a single post, even though it was mostly about Jeff Weaver. I can say that Jeff is actually a great guy and we’re all very disappointed he’s not back here with the Dodgers. However, as Ned has said many times, the asking price and the offer were simply too far apart to be able to get something done. Unfortunately, that’s the business of this game and hopefully Jeff will have continued health and success elsewhere.